Being either brave or foolish depending on your perspective, I left a career in law to work with my husband who ran his own successful bar. Both needing a new challenge, we went for bar number 2, opening The Cornerhouse in July 2016. We built the sort of bar we'd love to spend time in ourselves. Generous food to share served all hours, live music, great wine, real ale & gin, & comfy seats. It's the little details that matter, from the perfect lighting to the right level of noise (atmospheric whilst being able to hear yourself talk! ), and knowing what our regulars order. For those reasons, we're at work a lot even when we're not meant to be working, but it's very personal to us & we're very proud of what we've created so it never feels too much of a slog. What was your reason for wanting to work Lucy at Ravenspoint Marketing - did you have a specific challenge that you needed help with? We had an existing website that was functional, but it didn't truly convey the atmosphere & look of The Cornerhouse, and we also wanted a website that we could update ourselves. Occasionally, a musician might not be able to play (such as in December when everyone's got sore throats! ), and it's great for us to be able to update our website on the spot with the details of the musician who's stepping into the breach for the evening. This also works where we need to update menus. Previously, we'd have to contact our website designer with new copy & wait for the website to be updated. Now our website is a true reflection of what people will find at The Cornerhouse on that day. We also wanted our website to interlink with social media so that any photos posted on instagram would also appear in a 'live' gallery on the website. Nope! We met Lucy and suddenly realised, from her portfolio, that our website could be doing a whole lot more for us than it was, & she was the girl for the job. We truly could not be happier with the end result. The website perfectly encapsulates what our business is and how it feels when you visit the bar. It is informative, easy to use, clean & stylish. We've had fantastic feedback from customers who check out our website every week to see which music acts are playing, & we're happy that those unfamiliar with The Cornerhouse - tourists for example - will have a really good feel for the place before they arrive. The Squarespace platform has been easy to get to grips with & I'm quite proud to have learnt a new skill. It is always gratifying when running your own business to see, in very tangible ways, something you've helped to make. Lucy was a great tutor when passing over the reins for the website, & I know further help will be available should I require it. Would you be happy to recommend Lucy for other website projects? 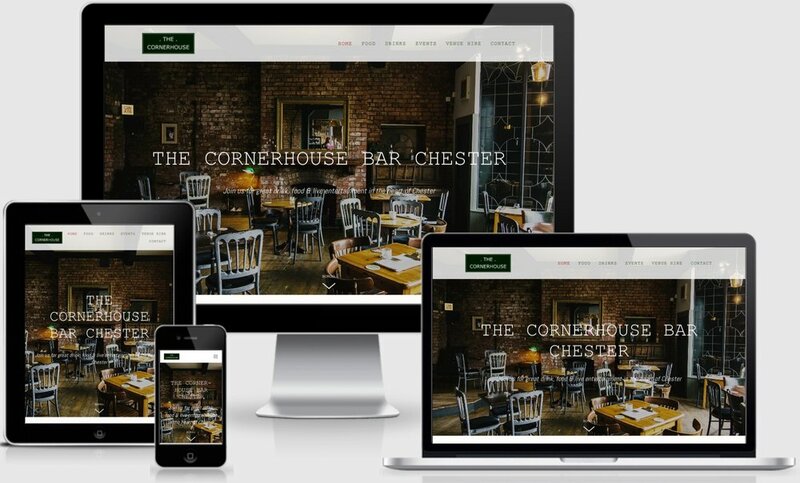 An insight as to how marketing expert Lucy Newall-Ellis of Ravenspoint Marketing worked with The Cornerhouse in Chester to create an effective website for their business. At Ravenspoint Marketing I work with exciting, innovative & driven businesses creating beautiful, professional and functional websites that can be updated and managed independently, by you!